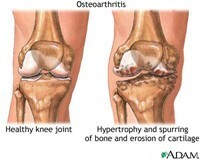 Osteoarthritis, also known as OA, is a type of arthritis that is caused by the breakdown and eventual loss of the cartilage of one or more joints. Cartilage is a protein substance that serves as a "cushion" between the bones of the joints. It commonly affects the hands, feet, spine, and large weight-bearing joints, such as the hips and knees. Most cases have no known cause and are referred to as primary OA. When the cause known, the condition is referred to as secondary OA. Primary OA is a chronic degenerative disorder related to but not caused by aging. OA symptoms most commonly affect the hands, hips, knees and spine. Unless you've been injured or placed unusual stress on a joint, it's uncommon for symptoms to affect your jaw, shoulder, elbows, wrists or ankles. One of the most common ways to deal with joint pain caused by OA is the use of NSAID's(Non steroidal anti-inflammatory drugs). Common NSAID's are aspirin, ibuprofen (Advil, Motrin, Nuprin), naproxen (Aleve, Naprosyn, Anaprox) and Cox-2 inhibitors such as Celebrex. None of these are without side effects including an aspirin like effect on the stomach and undesirable effects of blood thinning. There are several effective natural ways to deal with joint pain. Diet and Weight Loss...Being overweight is a clear risk factor for developing OA. Losing a pound results in a four pound reduction in knee-joint load for each step. Besides controlling weight there are foods to eat and foods to avoid. Eat kale, artichoke, celery, turnip greens, mustard greens, lettuce, millet, barley, almonds, black mission figs, cherries, pineapple, blackberries, black currants, limes, olive oil, and gelatin. Avoid sugar, refined foods, fried foods, junk food, caffeine, spinach, asparagus, rhubarb and limit dairy products. Supplements...Glucosamine, chondroitin, MSM, niacinamide are some of the most effective supplements. Glucosamine seems to actually help build cartilage. Other supplements include flax seed oil, vitamins, especially A, C, E and D, zinc and selenium. Black Cohosh (Cimicifuga racemosa)—Is an anti-inflammatory, an antispasmodic, and a digestive stimulant. Burdock (Arctium lappa)—Is nutritive and an alterative. Chaparral (Larrea mexicana)—Is an anti-inflammatory and an antihistamine. Devil's claw (Harpagophytum procumbens)—Is an anti-inflammatory and an analgesic. Juniper (Juniperus communis)—Promotes digestion and excretion of uric acid and dispels gas. Caution: Juniper can cause kidney irritation. Do not use more than 6 weeks in succession. Do not boil leaves, infuse only for 20 minutes. Yucca (Yucca spp)—Is an anti-inflammatory and an antispasmodic. Physical Therapy...Physical therapy, supervised by a certified physical therapist, can help reduce OA-related pain, usually by strengthening the muscles and tendons that support the joint. Typically, the first goal is stretching to improve the range of motion. Then comes strengthening the surrounding muscles, and then a plan for aerobic exercise, such as swimming or bicycling, to increase overall fitness and control weight. Water Exercise...Water exercise (also called aquatic exercise, pool therapy, or hydrotherapy) can include aerobic or endurance activities, stretching and strengthening exercises, and range-of-motion exercises performed in warm water. The buoyancy of water supports the body's weight. In waist-deep water, you bear about 50% of your weight. In chest-deep water, you subtract another 25% of your body weight. For osteoarthritis patients who struggle to stand and walk on weight-bearing joints, like the hip and knee, there is less stress on the joints in water. When starting a water aerobics program, it is helpful to join a class. The benefit of taking a class is that you will have a trained instructor and fellow class members to offer encouragement and support. If you have osteoarthritis, there are a variety of things you can do to relieve pain and strengthen joints. Sometimes pain is inevitable but how we deal with suffering is optional. Attitude and self confidence are important. Keep in mind the body, mind, spirit connection. Changing your thinking can change your life.